More money will be spent on this presidential election than any in history. The Supreme Court’s Citizens United decision laid the ground, and more than any other single person Karl Rove is making it a reality. The GOP strategist who engineered the presidency of George W. Bush, Rove is back, pulling the strings to Mitt Romney and realizing a billion-dollar campaign through his SuperPAC American Crossroads and its affiliated nonprofit, Crossroads GPS. What’s at stake for Romney is clear: the presidency. What’s at stake for the future of American politics, and what’s the lay of the land on the cusp of the November elections will be the subject for consideration when best-selling author Craig Unger appears at Kopkind’s annual Harvest fundraiser, on Sunday afternoon, October 14, at the Organ Barn in Guilford. 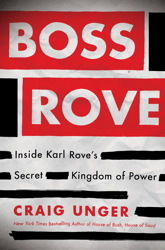 Unger, a contributing editor of Vanity Fair and the acclaimed author of House of Bush, House of Saud and other books, has written a new one, Boss Rove: Inside Karl Rove’s Secret Kingdom of Power. Dissecting Rove’s history of stolen votes, attack-dog politics and billionaire connections, Unger argues that Rove’s tactics are not aimed simply at winning elections; rather, they reflect “a far more grandiose vision — the forging of a historic re-alignment of America’s political landscape,” an effort to capture all three branches of government through “gam[ing] the American electoral system by whatever means necessary.” To that end, Rove has also been at the forefront of pushing the Republicans’ voter suppression efforts this year. Unger, whose work was featured in Michael Moore’s Fahrenheit 9/11, has written for Esquire, The New Yorker and other magazines, was the deputy editor of The New York Observer and the editor of Boston Magazine. He was a friend of Andrew Kopkind, the Guilford resident called “the greatest journalist of his generation” when he died in 1994, in whose memory the Kopkind Colony was launched in 1998. This will be the fifteenth Harvest fundraiser for the seminar/retreat project, which brings journalists, filmmakers and political activists from around the country and world to Guilford each summer for a week of cultural and political stimulation, reflection and rest. The event, at the Organ Barn, 158 Kopkind Road, in Guilford, begins at 2 pm with a Harvest Late Brunch, a tapas feast, followed by Craig Unger’s talk. Tickets are $35, $25 for students. This is the only local benefit put on by Kopkind, which also presents free public movies and lectures in the summer. For reservations, more information or directions, contact 802.254.4859, or stonewal@sover.net.